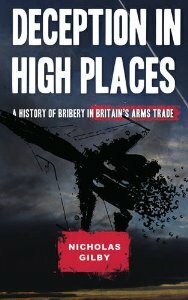 In ‘Deception in High Places’ (Pluto Press) Nicholas Gilby traces the history of corruption in the Arms Trade – with particular emphasis on Britain’s fifty-year relationship with Saudi Arabia – and seeks to prove that ministers of state and other top officials knew about, approved, and colluded to conceal, millions of pounds worth of bribes over the decades. The book is largely the result of Gilby’s nine-year forensic trawl through government records, many of them previously unseen and obtained through Freedom of Information battles with the Foreign and Commonwealth office. Gilby’s history culminates with contemporary scandals surrounding Al Yamamah – the biggest ever arms deal in history. These are the subject of ongoing, in-depth scrutiny elsewhere – the Guardian, Private Eye and Exaro for example – but uniquely interesting in Gilby’s book are the seven out of his nine chapters which chronicle the evolution of ‘grand corruption’ and its widespread acceptance at the heart of the British establishment. At times a little dry, more colourful interludes derive from private papers and letters Gilby has also uncovered. He takes an almost Rabelaisian delight in detailing the lavish ‘sweeteners’, worth millions of pounds, that BAE heaped upon Saudi Prince Turki bin Nasser and his family under the cryptically entitled ‘Al Yamamah benefits programme’. Gilby starts his narrative in 1964, when there were ‘only six British businessmen in Saudi Arabia’. Pioneering arms agent, Geoffrey Edwards, was one of these and he worked hard to procure large sales for the British Aircraft Corporation (BAC). From the outset, governments were involved and ‘sweeteners’ or ‘douceurs’ worth millions in today’s money were part of the deal. When BAC found itself competing with American firms for a huge 1965 Saudi Arms deal via Edwards and Lockheed’s new agent, Adnan Khashoggi , a joint deal was brokered by the Pentagon; documents show that Harold Wilson’s government knew that 7.5 percent of the British firm’s £1.5 billion share was designated for ‘special commissions’ to top Saudis including the Minister of Defence. Since 1968, the British Government has had a dedicated arms marketing department within the Ministry of Defence, using its network of Ambassadors and Military attachés to identify opportunities and promote UK manufacturers. Gilby shows how these officials were aware of the bribery involved in procuring contracts. Willie Morris, UK Ambassador to Saudi Arabia in the late 1960s, perfected the art of the ‘deniable fiddle’, kept a file on corruption and had a list of ‘who pays whom in the Kingdom’. This enduring template for systemic bribery, established fifty years ago, is more easily excavated than those which followed in an increasingly crowded and complicated market. Gilby implies a deeply entrenched, amoral attitude to arms deals throughout the establishment, and collusion between its various branches to achieve desired outcomes: in the 1970s, ‘special commissions’ paid to British subjects were routinely reported to the Inland Revenue because such payments were ‘tax-deductible’; companies also told the Bank of England about them in order to comply with Exchange Control regulations, and the Bank asked the Treasury to agree any commission over 10% of the contract value. When Edwards sued the British company Associated Electrical Industries for unpaid commissions in 1974, diplomats briefed the company on editing and codifying potentially incriminating documents which might ‘damage Britain’s commercial interests’ and provoke a public outcry for anti-corruption legislation. Another would-be litigant, Shapoor Reporter, who lubricated many arms deals with Iran, dropped his case against the Ministry of Defence when the Inland Revenue suddenly developed an interest in his bank accounts. Gilby highlights a cynical disregard, among successive British governments, for how the arms being brokered might be used; as well as the Saudis and Iranians, other famously oppressive clients included Indonesia’s President Suharto. Gilby details the history of anti-corruption legislation and shows how even well-intentioned laws were cynically manipulated by both sides to enhance their own positions. The Saudis were the first to institute a ban on bribery in 1968, shortly followed by the Lebanese and Iranians. Nevertheless, members of each government carried on asking for, and receiving, bribes; as Gilby acerbically comments: ‘the Shah’s anti-corruption campaign… wanted to limit all pay-offs to himself and his family’. US President Jimmy Carter’s Foreign Corrupt Practices Act of 1977 was gleefully received in Whitehall where huge commissions on two new government-to-government arms deals with Saudi Arabia were being approved. Britain now had the advantage over the Americans since the Pentagon could no longer compete on ‘sweeteners’. An evaluation of the impact of America’s anti-bribery legislation found that 30 percent of exporters had lost business because of it. This prompted Margaret Thatcher’s Trade Secretary John Nott to announce, in 1979, that he would not be party to ‘any move which would seriously impede British exporters to the Middle East’. It would be twenty years before Britain finally signed the OECD Anti-Bribery Convention and the UK’s own Bribery Act did not come into force until July 2011. Margaret Thatcher instructed Defence Secretary Francis Pym to ‘exploit all possible opportunities to extend overseas markets for defence sales’ and the seeds for Al Yamamah were sown. Subsequent British governments of all hues have diligently tended to this lucrative, ongoing, source of contracts and the establishment has backed them up. In December 2006, the Blair government pressured the SFO to drop its corruption investigations into Al Yamamah. Ministers feared that revelations about the huge bribes involved would anger the Saudis and prompt them to pull out of the next stage. Just one month later, a large new order was placed and later in the year, King Abdullah arrived in London on a State visit which culminated in a banquet at Buckingham Palace. In 2012, the SFO launched another investigation into a Saudi-British deal after an executive at defence giant, GPT, whistle-blew about suspicious payments being channelled via Ministry of Defence intermediary Sangcom. Gilby’s conclusion that ‘plus ça change, plus c’est la même chose’ is born out by the recent news that this enquiry, too, has apparently been discreetly dropped. If the book has a flaw, it is its failure to place the arms deals it discusses into a wider political context – it is particularly woolly in the section on Lebanon, for example – but it nods to the Arab Spring and the combustive effect on those revolutions of deception in high places. Ending with a call for greater transparency and more robust, enforceable, anti-corruption legislation, Gilby produces some well-reasoned answers to the most commonly offered justifications for bribery. If ‘everybody does it’ and it’s part of ‘their’ culture, he argues, why would the Saudi regime have issued anti-corruption decrees in 1968, 1975 and 1978, and gone to such extreme lengths to keep their activities secret? ‘Deception in High Places’ is an intriguing and worthwhile read for researchers, campaigners, students of politics and international law, and anyone interested in the darker recesses of governmental politics and human morality. In ‘Deception in High Places’, Nicholas Gilby traces the history of corruption in the Arms Trade – with particular emphasis on Britain’s 50-year relationship with Saudi Arabia. This book is largely the result of a nine-year forensic trawl through government records, many of them previously unseen and obtained through Freedom of Information battles with the Foreign and Commonwealth office. Gilby seeks to prove that UK ministers of state and other top officials knew about, approved, and colluded to conceal, millions of pounds worth of arms-related bribes from over the decades. Gilby’s history culminates with contemporary scandals surrounding Al Yamamah – the biggest ever arms deal in history. These are the subject of ongoing, in-depth scrutiny elsewhere – the Guardian, Private Eye and Exaro for example – but uniquely interesting in Gilby’s book are the seven out of his nine chapters which chronicle the evolution of “grand corruption” and its widespread acceptance at the heart of the British establishment. At times a little dry, more colourful interludes derive from private papers and letters Gilby has also uncovered. He takes an almost Rabelaisian delight in detailing the lavish “sweeteners”, worth millions of pounds, that BAE heaped upon Saudi Prince Turki bin Nasser and his family under the cryptically entitled “Al Yamamah benefits programme”. “Benefits” included the 1995 hire of a large freighter jet to transport Princess Noura’s Rolls Royce and furniture from America to Saudi Arabia, purchasing and running a professional film unit and studio to record a family wedding, and a £55,000 restaurant visit to Maxime de Paris. Gilby starts his narrative in 1964, when there were “only six British businessmen in Saudi Arabia”. Pioneering arms agent, Geoffrey Edwards, was one of these and he worked hard to procure large sales for the British Aircraft Corporation (BAC). From the outset, governments were involved and ‘sweeteners’ or ‘douceurs’ worth millions in today’s money were part of the deal. Since 1968, the British government has had a dedicated arms marketing department within the Ministry of Defence, using its network of ambassadors and military attaches to identify opportunities and promote UK manufacturers. Gilby shows how these officials were aware of the bribery involved in procuring contracts. Willie Morris, UK Ambassador to Saudi Arabia in the late 1960s, perfected the art of the “deniable fiddle”, kept a file on corruption and had a list of ‘who pays whom in the Kingdom’. This enduring template for systemic bribery, established 50 years ago, is more easily excavated than those which followed in an increasingly crowded and complicated market. Gilby implies a deeply entrenched, amoral attitude to arms deals throughout the establishment, and collusion between its various branches to achieve desired outcomes: in the 1970s, “special commissions” paid to British subjects were routinely reported to the Inland Revenue because such payments were “tax-deductible”; companies also told the Bank of England about them in order to comply with Exchange Control regulations, and the bank asked the Treasury to agree any commission over 10% of the contract value. When Edwards sued the British company Associated Electrical Industries for unpaid commissions in 1974, diplomats briefed the company on editing and codifying potentially incriminating documents which might “damage Britain’s commercial interests” and provoke a public outcry for anti-corruption legislation. Gilby details the history of anti-corruption legislation and shows how even well-intentioned laws were cynically manipulated by both sides to enhance their own positions. The Saudis were the first to institute a ban on bribery in 1968, shortly followed by the Lebanese and Iranians. Nevertheless, members of each government carried on asking for, and receiving, bribes; as Gilby acerbically comments: “the Shah’s anti-corruption campaign… wanted to limit all pay-offs to himself and his family”. US president Jimmy Carter’s Foreign Corrupt Practices Act of 1977 was gleefully received in Whitehall where huge commissions on two new government-to-government arms deals with Saudi Arabia were being approved. Britain now had the advantage over the Americans since the Pentagon could no longer compete on “sweeteners”. Gilby documents the British government’s resistance, throughout the 1970s, to UN and Organisation for Economic Co-operation and Development (OECD)-led calls for international agreements against corruption. Although British officials attended working groups, they were briefed to delay or disrupt progress. A Ministerial Group on Improper Trade Practises expressed relief when a major loophole in the first draft agreement was spotted, advising: “a company will be able to evade the agreement entirely, merely by employing non-nationals to carry out corruption for it abroad”. An evaluation of the impact of America’s anti-bribery legislation found that 30 percent of exporters had lost business because of it. This prompted Margaret Thatcher’s trade secretary John Nott to announce, in 1979, that he would not be party to “any move which would seriously impede British exporters to the Middle East”. It would be 20 years before Britain finally signed the OECD Anti-Bribery Convention and the UK’s own Bribery Act did not come into force until July 2011. Deception in High Places is an intriguing and worthwhile read for researchers, campaigners, students of politics and international law, and anyone interested in the darker recesses of governmental politics and human morality. This entry was posted in Uncategorized and tagged Adnan Khashoggi, al-Yamamah, Francis Pym, Geoffrey Edwards, Jimmy Carter Corrupt Practices Bill, John Nott, review, Sangcom, Shapoor Reporter, Thatcher on April 17, 2014 by susandemuth.